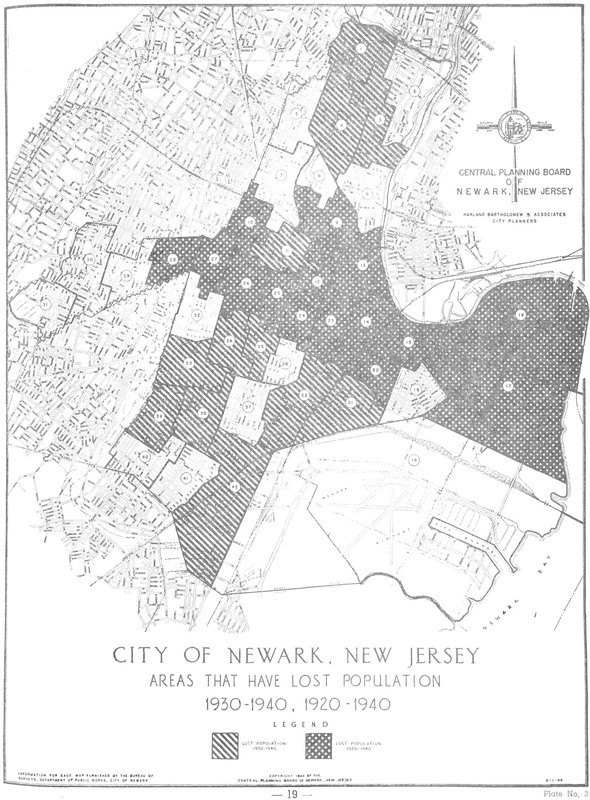 In “A Proposed Housing Plan for Newark,” the 1947 Master Plan shows “Blighted Areas” marked to rehabilitate, and “Obsolete Areas” marked to clear and rebuild. 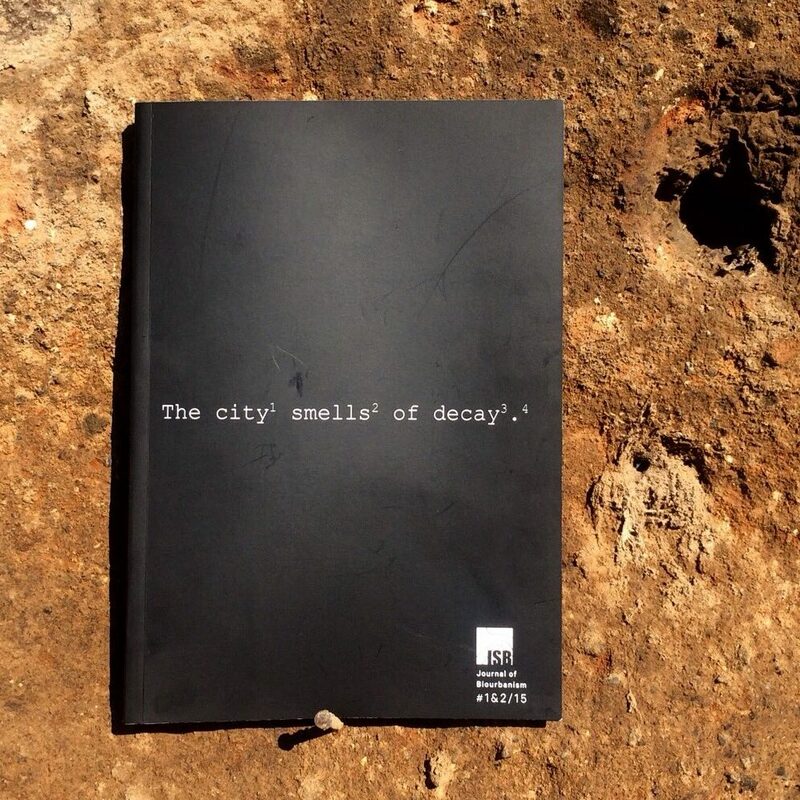 Of the “Day of Reckoning,” the Chairman, Peter A. Cavicchia from the Central Planning Board, wrote about the “ills” of the American city in which “Newark is no exception”—“ills” that came from “slums, blight, inadequate street pattern, over-crowding, obsolescence, population change, and high tax rate.” The Central Planning Board decided that the U.S. cities of 1947 had become “plague centers for disease and cesspools of crime vice,” shamefully allowed to “come into being and exist” for so long. Norbert Elias, too, noted such a response in The Civilizing Process, specifically in his genesis of “Changes in the Behaviour of the Secular Upper Classes in the West,” where he observed differences in shame standards over time. In 1939, Elias noticed, since the transition into capitalism, “what first aroused and increased the distasteful feelings and restrictions was a transformation of human relationships and dependencies.” Elias found that in societies of both greater interdependency and greater division of labor, things related to bodily function—such as in later years, things related to sewage and water—were standards not initially changed due to health and safety reasons, but because of the advanced threshold of repugnance from the upper classes. Central Planning Board Newark, New Jersey. 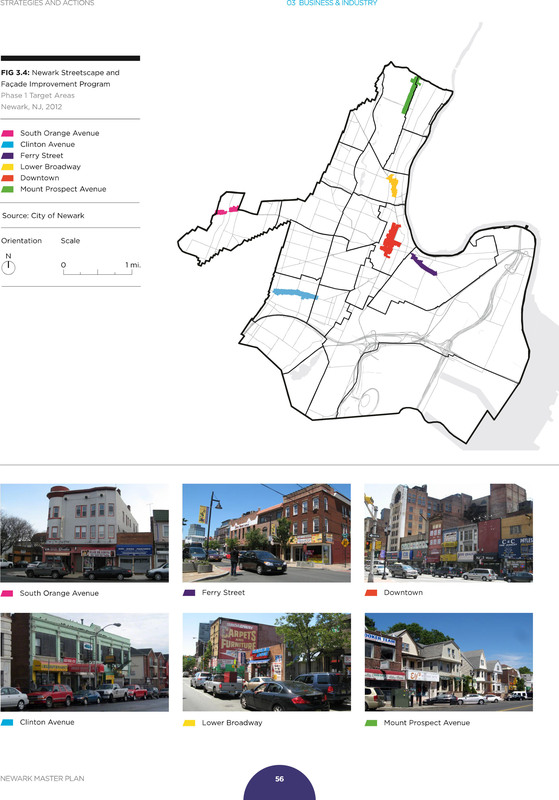 The master plan for the physical development of the City of Newark, N.J., op. cit. (p. 8). Central Planning Board Newark, New Jersey. 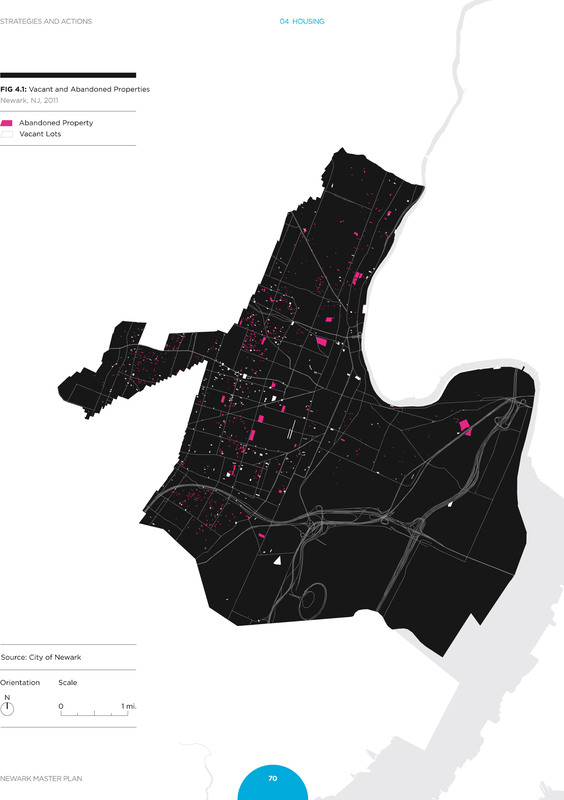 The master plan for the physical development of the City of Newark, N.J., op. cit. (p. 14). Central Planning Board Newark, New Jersey. 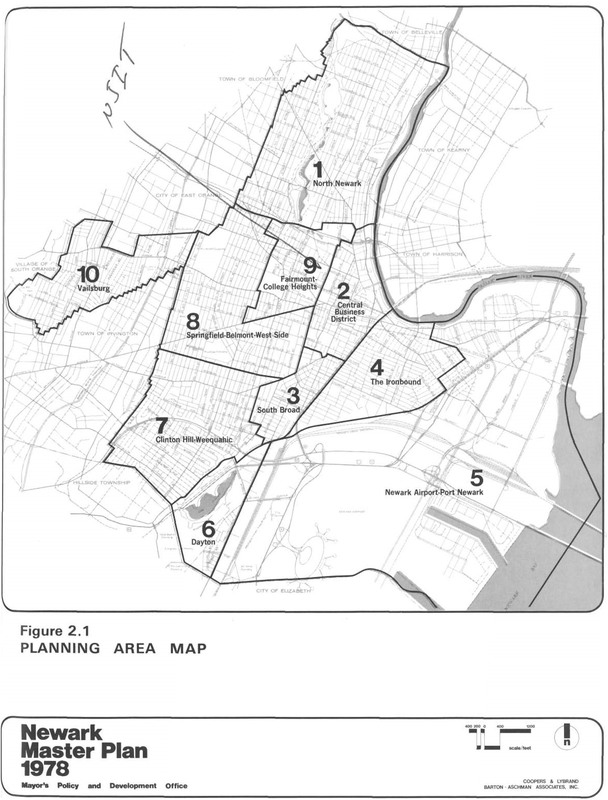 The master plan for the physical development of the City of Newark, N.J., op. cit. (p. 43, Plate 5). Central Planning Board Newark, New Jersey. 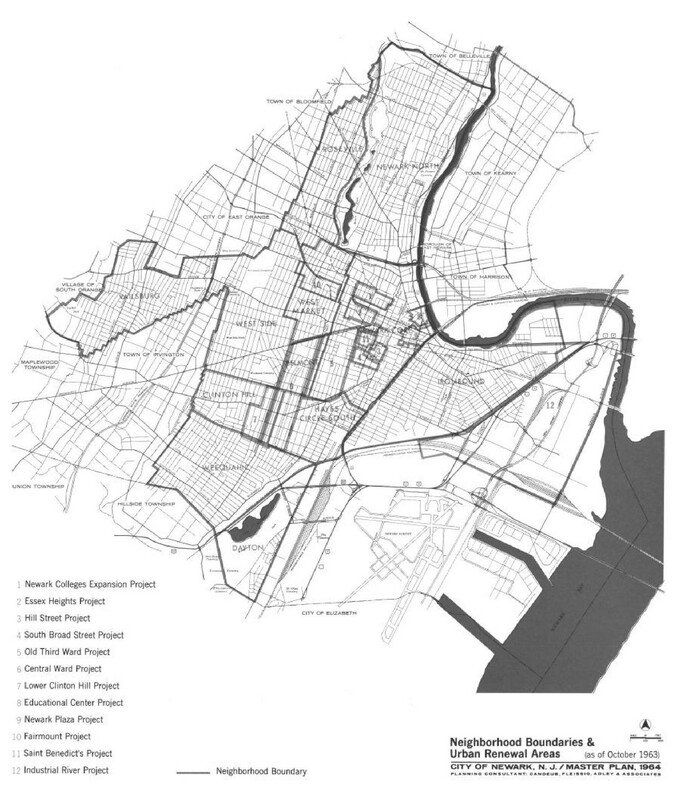 The master plan for the physical development of the City of Newark, N.J., op. cit. (p. 2). Central Planning Board Newark, New Jersey. The master plan for the physical development of the City of Newark, N.J., op. cit. (p. 1). Elias, N. (2000 ). 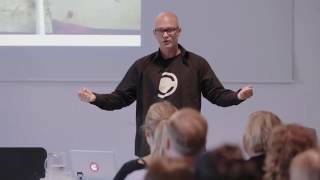 The civilizing process: Sociogenetic and psychogenetic investigations. E. Dunning, J. Goudsblom, & S. Mennell (Eds.). (E. Jephcott, Trans.). (p. 134). Malden, MA: Blackwell. According to the 1964 Plan, Newark at that time was a regional shopping hub, professional and office service center, a key industrial and logistical platform, and the national headquarters for Mutual Benefit and Prudential Life Insurance Companies. Heavy out-migration to single-family detached dwellings in the surrounding metropolitan area suburbs continued. 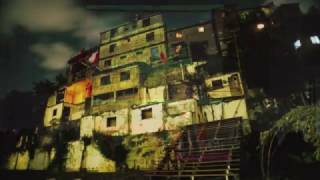 In modern times, blight, or urban decay, typically occurs when in close proximity to a larger city. 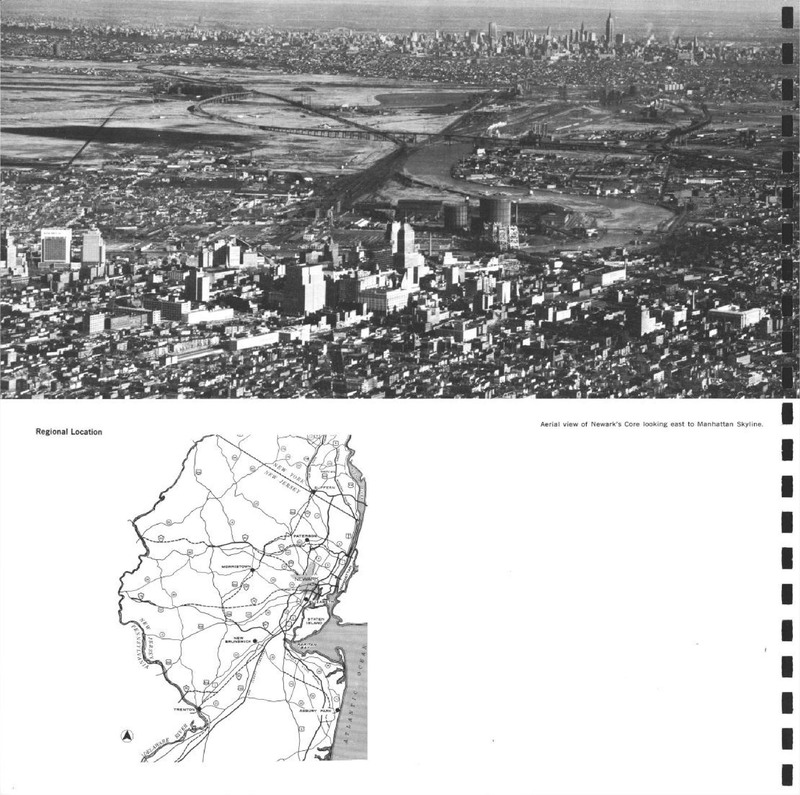 In this 1964 Plan, it is noted that Newark, as its own core, is also within a significantly larger metropolitan core. 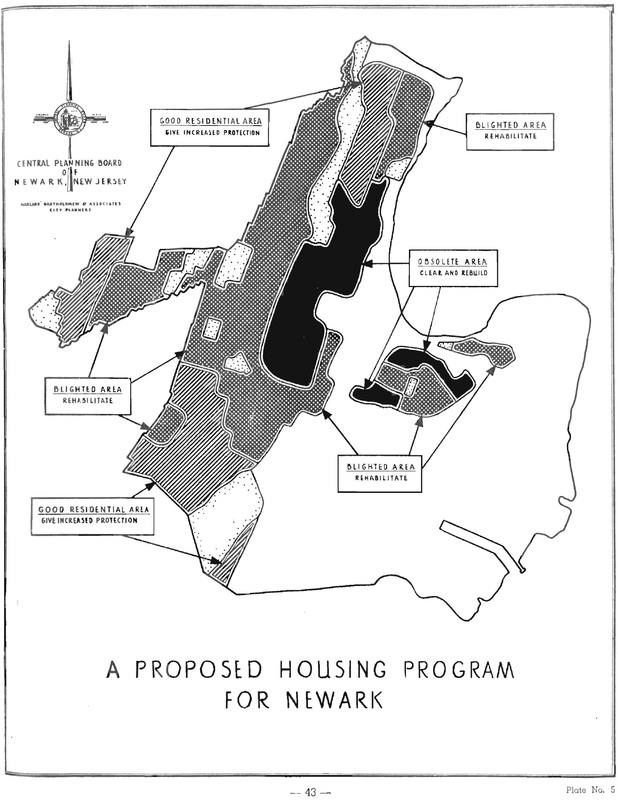 After the 1947 Plan, the 1964 Plan placed additional confidence in existing and future urban renewal projects with the expectation that by 1980 the renewal projects would slow Newark’s out-migration and attract new population due to increased housing stock. Even though more population decline was expected for the population outside the renewal areas, an increase in population was anticipated wihtin the renewal areas, implemented after the previous 1947 Plan. Division of City Planning. 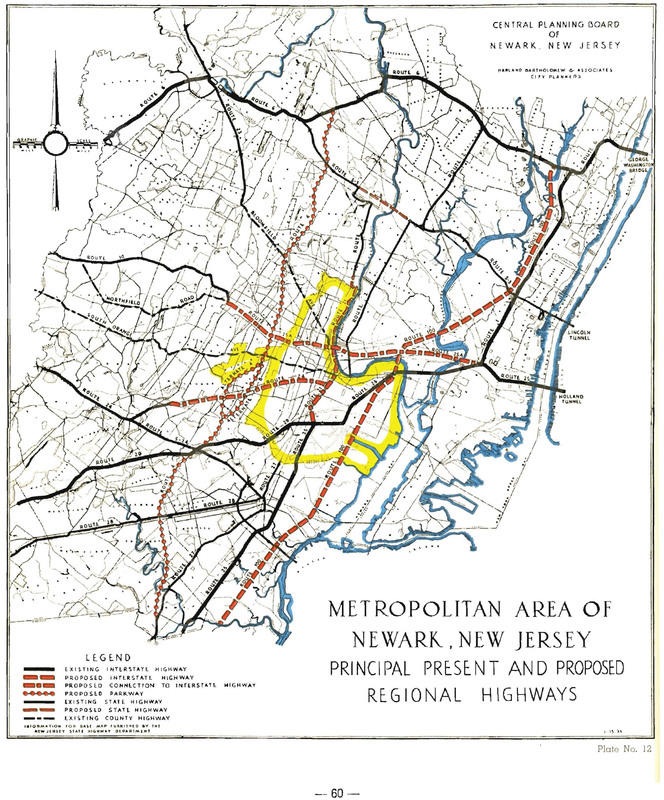 Master plan 1964 City of Newark N.J., op. cit. (p. 11). Division of City Planning. Master plan 1964 City of Newark N.J., op. cit. (p. 13). Division of City Planning. Master plan 1964 City of Newark N.J., op. cit. (p. 14). Division of City Planning. Master plan 1964 City of Newark N.J., op. cit. (p. 15). 1971 is the historical year of the Nixon Shock that included the end of dollar convertability to gold, meant to tame the domestic problem of inflation. It is the end of Bretton Woods. The Mayor’s Policy and Development Office. 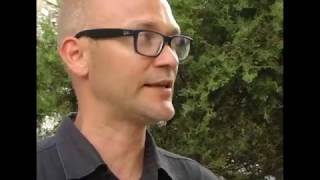 Newark master plan, op. cit. (p. 2). 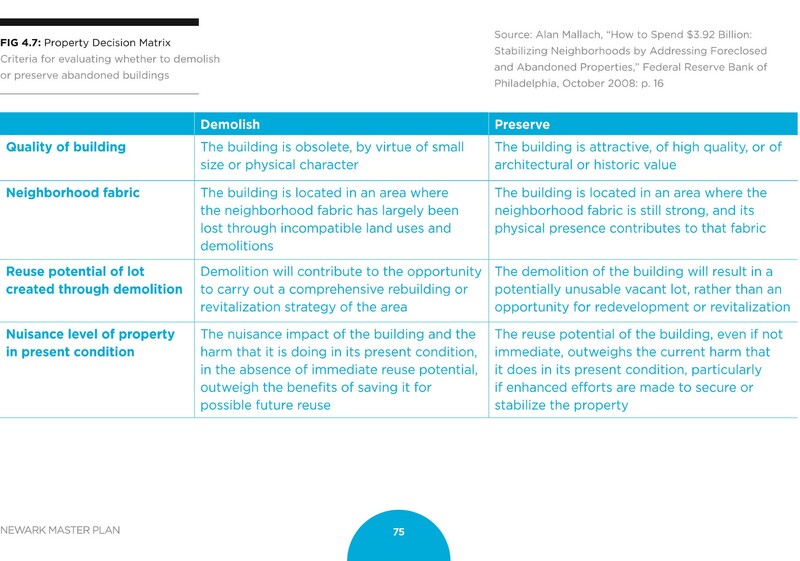 In contrast to Newark’s 1947 Master Plan that designated areas “blighted” or “obsolete,” the 2012 Master Plan’s second mention of “obsolete” does not appear until a reference to a criteria-based, decision-making matrix when questioning whether the City should demolish or preserve a building. Rather than designating “obsolete” directly and overtly to an entire neighborhood, it is instead suggested that “obsolete” designate a single building on a smaller scale. And yet, “in areas targeted for growth and development, Newark has the capacity to add more than 20,000 new housing units without significantly increasing densities or changing the character of existing residential neighborhoods.” The 2012 Master Plan writes that land use and the physical environment is only a part of Newark’s transformation. “Well-being” in Newark between today and 2025 may be more about changing people and behaviors. Central Planning Board Newark, New Jersey. The master plan for the physical development of the City of Newark, N.J., op. cit. (p. 3). Elias, N. The civilizing process, op. cit.